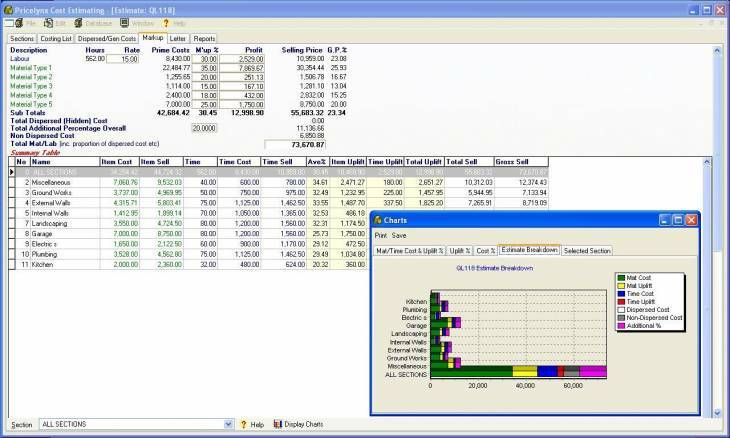 Pricelynx cost estimating software is a designed for pricing all types of project and production costs. The programs flexibility accommodates all types of commerce and industries from production costing to construction projects. A database can be compiled as you are costing to hold cost and time elements of individual items or processes for complete granularity. Where a number of items, or processes make up a component of the project these items can be grouped into an assembly, for faster future costing. Each estimate can be split into sections or cost centres for the project, allowing a different uplift to be applied to different areas of the project. If a sell price is required, a flexible facility is available to tailor profit margins as you wish. Full management audit reports and charts are available, as well as material listings and selling rates.